White Wolf : Abused zoo bear was rescued and finds a best friend at wildlife sanctuary. 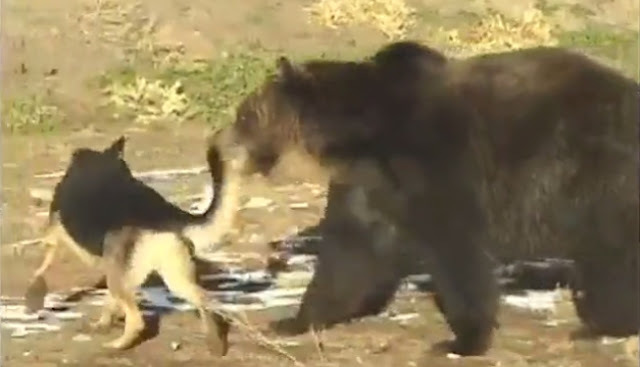 Abused zoo bear was rescued and finds a best friend at wildlife sanctuary. He was found at a roadside zoo that was closing down, just a few weeks old. It was clear even then that he was a "differently-abled" bear. Boychuk the German Shepherd. It was Boychuk who gave him the courage to go to the Wildlife Garden and play. To see the care and affection with which he plays with Boychuk, holding back his strength, adds a new dimension to one's perception of grizzly bears. Humble Bumble, is a bear of character. Named after a passionate earth-mother wolf with a fire in her belly to protect anything vulnerable, Earthfire was founded in 2000 to develop a new model of relating to nature through the voices of the rescued wildlife under its care. A 40 acre wildlife sanctuary and retreat center, it is located on the western slope of Grand Teton National Park, near Driggs, Idaho. Responses to "Abused zoo bear was rescued and finds a best friend at wildlife sanctuary." Now that is something you don't see everyday. That dog will be completely wore out. Nice to see.